...for your commitment to Taylor Linens and to the growth of our company. Your feedback in our survey this year was absolutely invaluable. We were so pleased with the overwhelmingly positive evaluation. 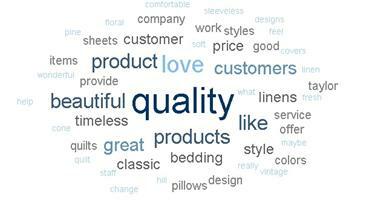 96% of you said our products are well made and high quality! 92% said we are a great value. 86% of you love the designs. Most especially helpful was your input on areas in which we can grow. We are going to continue to improve our product availability in order to minimize back-orders and are reevaluating our return policies and looking into ways in which we can streamline this process for you. The biggest area of growth, with 10% of you dissatisfied (still not bad! ), was with the need for more variety, colors, and trendier pieces. In light of that we will continue to work on fun new ideas and colors! Overall, we were so encouraged by the feedback we received from the survey. We heard from many of you that you are thrilled with the new swatch books and we are so happy about that. We will continue to try to make our collections easy to see and order. The desire for more color options, more trendy pieces, and even a return to some of our previous collections, will be addressed within this coming year. In fact, Taylor Linens will be adding over 20 new collections by the end of 2013 alone- we couldn't be more excited about this coming show season. We are thriving and growing today because of customers like you. Thank you for your loyalty to our brand. We consider each of you dear friends. And a very special thank you to the brains behind this operation. Perceptyx Inc. designed and managed our survey so well, and it was only through their generosity that this was possible. "I love the look and feel of Taylor Linens, my customers love their product. Once a customer buys something from Taylor Linens, they keep coming back for more. Product is always 1st grade, no returns for defective product. Happy customers, Happy business owners." "Very nice quality, fast shipping, helpful staff, designs fit our customer base, up to date info regarding in stock and back ordered items." "Add more variety to the styles... multiple swatch sets would also help. " "I love the quality, appearance, and the fact that it is a family business around for a long time. " "It is attractive, well made. the fabrics wash up well, retain their colours and shapes. the bedding has not yet needed ironing - and the designs used are charming. As it is a smaller company, you feel really in touch with the decision makers: and they are flexible in trying to help you out wherever possible: and not insisting on an order totaling thousands of dollars.. I really like this company, and what they make: and look forward to being a long term customer. " "You have already made some very big improvements which are very much appreciated- the inventory download, swatch rings are a huge help! It would be great to see a few more details in your product descriptions and a wider variety of products. Thanks for asking! " "I think Taylor Linens does a great job with their product design and with what they do carry. Their products are easy to mix and match, change a look very easily. Stay true to the products and design you are known for, that touch of "Country Elegance" to "Getting Lost in Luxury"! " "I don't have another company of the many I work with that is as kind, helpful and accommodating as the staff at Taylor Linens. I am very grateful I found them for my store... "